Alrighty!!!! I currently use a simple watercooling rig. Resevoir, Pump, Radiator with 2 120mm Fans, Waterblock. I am currently looking to make a waterbong to bring my 26C water temp down. I am looking at a 33 gallon trashcan for the resevoir and a cheapo shower head bought at Wal-Mart. My question is do I need to place fans in there to circulate the air? I understand that it will definitely help but are they required? Any helpful hints would be greatly apreciated. Well I built it all the same! 1 thirty-three gallon plastic trash can. Trash can is about half full, and one fan is intake and the other is exhaust. Temps went from 19C Idle/26C Load to 10C Idle/16C Load. um you have a tower section? or it it just a half filled bucket with water being sprayed in by shower head? i got mine all built, just needs leak testing and a waterblock! 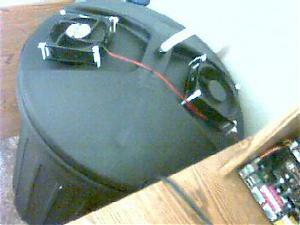 It's a 33 gallon trashcan with the shower head inserted through the center of the lid and 2 holes cut out for the fans. The can is about half full and ther is about a 1 foot drop for the water. The fans are positioned with one intake and one exhaust and the water passes through the air flow. When I get home(at work now) I will get some pics on the web cam. It's a crappy camera but you will get the idea. I ran CPUBurn all night and my CPU temp was at 16C when I got up. That's acceptable temp for me. Now I just gotta do the VCore hack on my board so I can crank up the Clock Speed. 16C? that's great for full load! I'm guessing your not taking that thing anywhere though. what does the inside look like? Now, I feel I need to clear this up. I am using the Water to cool a 156 Watt TEC. That's how I got the 16C. Nice. I was like how the heck did you do that w/o a tec of some sort. that makes sense though. my lan party system required a 5gallon bucket for awile. 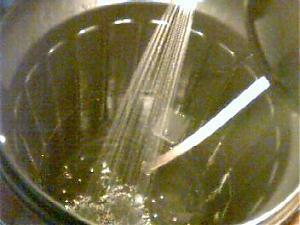 It seems that the water is finally heating up, It's running at 17.5C now under full load. Still a very respectable temp. Now just need more voltage!!! You could get creative and dump a bag or two of ice in the bucket. Yeah, hook it up to an ice making machine, one of those ones that dumps out a certain volume of ice within a specific time period. Of course portability then becomes a pipe dream. Well Portability in my case is already a pipedream. I am currently looking into getting the compressor out of my Mother-in-law's old fridge. That some copper tubing and I will have to figure out an Evaporator of some type. Then I can add Vapor Phase to the mix =). Probably use the VP to cool the water. I have also toyed with the thought of using the waterblock as an evaporator. Just don't know if it could hold up in that environment. I sure hope so. I will have to test the $*@% out of it to be sure it won't leak. As far as Evaporation, It eats water. I have to fill it every week or so. I actually went 2 weeks without filling in november but the level was really low when I got back from vacation. That's why I am looking for an alternate form of cooling the water. But like I said, I may loose the water all together in favor of a custom built Vapor Phase cooler. The reason you'er getting a raise in temp. is because the evaporation in your system is not effective. From your setup, the air circulation is only on the top of the system. 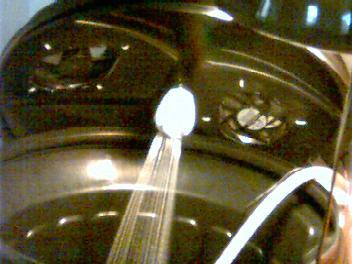 It did not actually gets to circulate through the shower spray to give effectiveness in evaporation. Put a duct at your inlet to around 50 to 70 mm above the water surface, this will direct the air flow to give you better efficiency. You can make a simlpe buffer tank in your system that will actually autofeed the buffer water into your system. Then you will not worry of the water level getting too low. The concept is the same as the water feeder used in chicken farm. I am developing a water low level alarm system for use in water cooling setup. It should be ready by end of January 2002. Does this setup raise the humidity in the room?Almost looks like my humidifier.The green trash can with with the fans is a kicker.LOL does it Hover under full load.I like it.